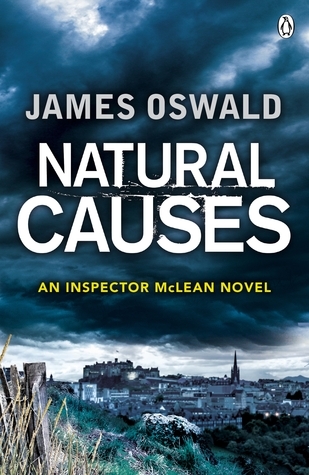 In Natural Causes, James Oswald introduces us to Tony McLean, a recently promoted Detective Inspector in the Edinburgh police force. Rivalries within the force are intense and when a leading local figure is found in his home brutally gutted with his throat slashed the case is judged too high profile for such a new inspector. But then work at a building site uncovers the remains of a young girl, horrifically and ritually slaughtered. She is mummified, her murder having taken place perhaps sixty years ago or more. McLean becomes obsessed with identifying the victim and tracking down at least one of her killers while they still live. And while McLean digs, more and more men and women die, either in terrible violence or as a victim of their own hand. McLean begins to realise that however illogical and fanciful it might seem the young girl who lay forgotten for all these decades might after all hold a key to some of the mysteries that have shaken the city. Natural Causes is the first in a series and so it’s vital that Tony McLean hooks us. He does just that. McLean is an interesting character, a single man with a past and some intriguing friends who come and go, often sleeping on his sofa after a night out in Edinburgh’s pubs. McLean’s parents were killed when he was just a child and he was raised by his grandmother who, as Natural Causes begins, is gravely ill in hospital, approaching the end of her long life. McLean doesn’t work on his own. In this book, McLean is building his team, from old colleagues (who now have to call him ‘sir’) and from new. The boss keeps an eye on him, caring and stern. The pathologist Andy Cadwaller is quite a character, which is just as well considering how many bodies he has to work on through Natural Causes. But it’s best to avoid DCI Duguid. I thoroughly enjoyed the mysteries at the heart of Natural Causes. I did guess whodunnit a little earlier than I’d hoped but this didn’t spoil my fun. Gore and horror are liberally splattered through the book but never too much, even for my delicately squeamish nature. The plot is intricate, deliciously twisty and, to make this a little bit different, there is a hint of the supernatural. This might not be to everyone’s taste – and it wasn’t entirely to mine – but it was kept to a low level and it did fit quite well with the mood of the novel and its investigations. Edinburgh is a great backdrop, both menacing and enticing. The mood of the novel is likewise both dark and humorous, warmed by some of its key characters. I was left wanting much more. You can tell how much I liked Natural Causes – I bought the other four books in the series that same day. This entry was posted in Crime, Review and tagged Crime, Crime catch up on March 4, 2015 by Kate (For Winter Nights).